The Valiant Heart sample is here! Sampler #1 is also available for free download via the same page. It contains the first four chapters of A SLIP IN TIME, SHADES OF THE PAST and HIS FAIR LADY. Hi - Mr KK here with an update on the Kathleen Kirkwood Sampler Edition. I've just finished uploading the new version, now titled Kathleen Kirkwood Sampler #1 to all of the major vendors. Unfortunately, I could not rename it on Lulu (which is the feed for the free version on Barnes and Noble), so I unpublished it. I did put it back up on Barnes and Noble but the lowest price I can post it for is 99 cents. It's available for free on our website, www.KathleenKirkwoodHistoricals.com (in PDF, Kindle and ePub formats) and on Google Play, Goodreads and Kobobooks (in ePub format). It's also available for 99 cents on Amazon for direct Kindle download and Barnes and Noble for direct Nook download. 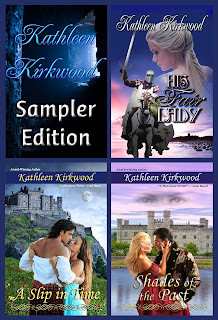 The Kathleen Kirkwood Historicals website has the links. Kathleen Kirkwood Sampler #2 will contain the first portions of the HEART series, which we'll start releasing in May. Our plan is to release one per month, so The Valiant Heart will be released in May, The Defiant Heart in June and The Captive Heart in July. The Gallant Heart (Rannulf's and Etainn's story) is planned for a 2014 release. Mr. KK here. This is just a quick note to let you know that the revised Kathleen Kirkwood Sampler Edition is now available on our website in PDF format, as well as on vendor sites in mobi and epub formats. All are free except on the Amazon and Barnes and Noble sites (we could never get them to match the “free” prices on the other sites). In the near future, we will be renaming this product to Kathleen Kirkwood Sampler #1 in preparation for the imminent release of the revised Anita Gordon HEART series, under the Kathleen Kirkwood name. 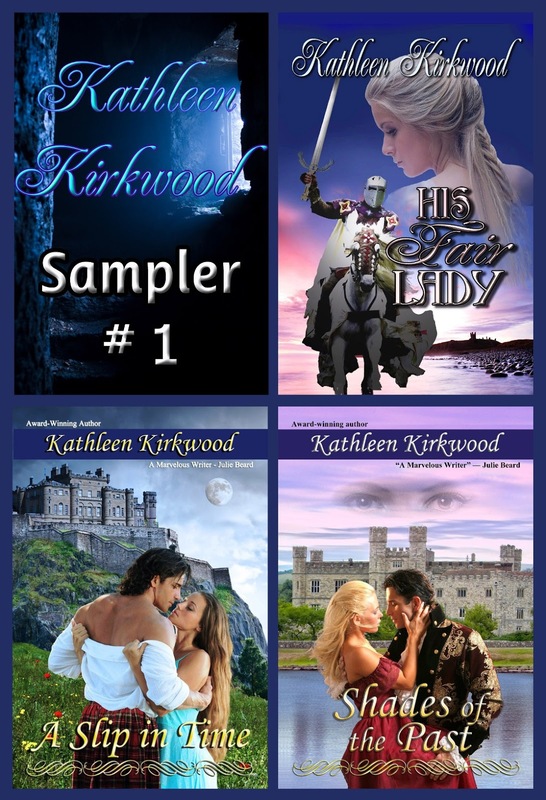 A preview of those books will be released under the title Kathleen Kirkwood Sampler #2. The Valiant Heart will be released in May, with the expectation that the other two books of the HEART series (The Defiant Heart and The Captive Heart) will be released in June and July, respectively. Kathleen Kirkwood Sampler #2 will be released in the same timeframe. Due to the re-prioritization of the HEART series, Pirates' Moon, which was originally planned for release at the end of 2012, has been rescheduled for a late 2013 release.